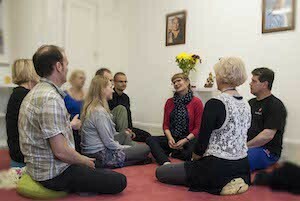 Our Buddhist Group was established in 2002 and is located in Heaton. We meet twice a week for a guided Buddhist meditation class – 16th Karmapa meditation. These classes are suitable for all who wish to learn to meditate. For newcomers there is always a short introduction to Buddhism and brief explanations on how to meditate. We regularly hold courses on Buddhism and Buddhist meditation classes, guided by experienced practitioners and travelling teachers appointed by Lama Ole Nydahl. We also have a small library with Buddhist books and magazines. All weekly Diamond Way Buddhist meditation classes are free of charge. 7.30 pm Introduction to Buddhism followed by guided Buddhist meditation – 16th Karmapa meditation. This meditation is suitable for newcomers and experienced Buddhists alike. 2.00 pm Four Foundational Practices meditation session. Suitable for those already practising Diamond Way Buddhism. There will be no regular meditation sessions between 17th December and 8th January 2019.